UPDATED: Thu., April 12, 2018, 2:59 p.m.
Ward Crawford is prohibited from using his 6-foot-5, 275-pound frame to check an unsuspecting skater against the Frontier Ice Arena glass Friday night. 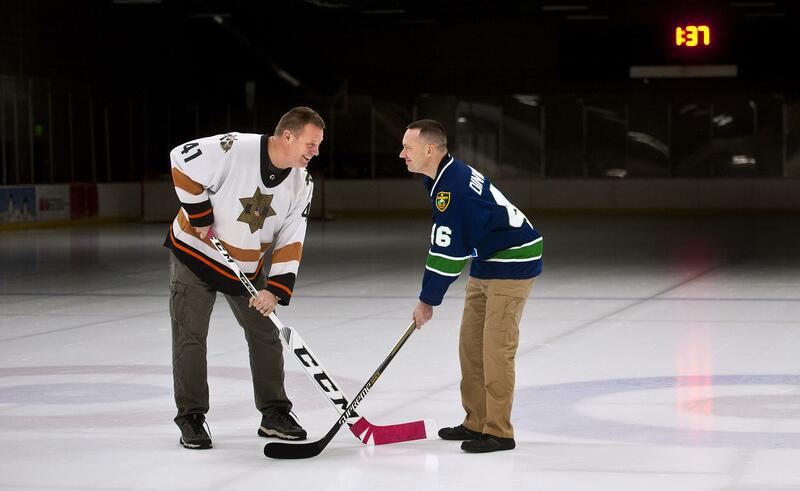 But that doesn’t mean the Kootenai County sheriff’s sergeant won’t enjoy a little contact when his band of North Idaho law enforcement officers face off against Spokane’s lawmen in a Battle of the Badges hockey game. “Checking isn’t allowed, but this isn’t a noncontact sport. There’s no out of bounds. Stuff happens. Physics apply, so what can you do?” said a tongue-in-cheek Crawford, a former University of Montana football player. Spokane County investigator Darren Dinwoodie said his squad would retaliate. “We might have to run your goalie,” joked Dinwoodie, a longtime friend and former men’s league teammate of Crawford’s. Both teams, an assembly of their respective counties’ law enforcement agencies, are playing for more than state line supremacy. Every dollar from the 6:30 p.m. game’s proceeds benefits the Sgt. Greg Moore K27 Forever Memorial, a water feature in Coeur d’Alene’s McEuen Park. The memorial will be unveiled on May 15, three years after Moore was shot and killed by Jonathan Renfro in a Coeur d’Alene neighborhood. Renfro was convicted and sentenced to death for Moore’s murder in November. With a bigger pool of officers and deputies, Dinwoodie swiftly manufactured a Spokane roster with experienced commodities from the Spokane Police Department, Spokane Sheriff’s Office and corrections officers. The Spokane team even has an FBI and Fish and Game employee. Crawford drew mostly from the Coeur d’Alene Police Department, Kootenai County Sheriff’s Office and a local fire department. A Rathdrum police officer and a former Bonner County sheriff’s deputy also filled the Idaho roster. “Half of our roster went to Spokane and that hasn’t done us any favors,” Crawford said. Many of the players on both squads either played against each other or teamed up in men’s leagues over the years. “The No. 1 goal is to raise money for a good cause and put on a good show,” Dinwoodie said. “But like any sport, once you put the hockey gear on and get out there, you see the other team and the other jerseys, you’re going to want to win. Coeur d’Alene Police Chief Lee White will drop the puck in a game that features officials from the Spokane Chiefs’ Western Hockey League. Randy Schwaegler, who has emceed Chiefs games, will be announcing Friday’s badge battle. McGruff the Crime Dog will also be swinging by the event. Tickets are $10 at the door and $7 online through eventbrite.com. “It will be a unique experience. I expect a pretty heavy crowd,” Dinwoodie said. Correction: Spokane County background investigator Darren Dinwoodie was misidentified as a Sheriff’s office employee in the original version of this story. Published: April 11, 2018, 8:03 p.m. Updated: April 12, 2018, 2:59 p.m.